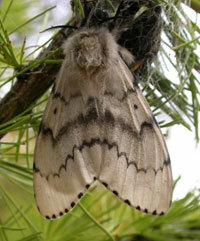 Adult male moths are light brown with a darker brown pattern on their wings. Their wingspan is just under 2 inches (3.5–4.0 cm). Females are slightly larger and have a wingspan of about 2.5 inches (~6.5 cm). Females are also almost entirely white in color with only a few dark markings on their wings. Newly hatched larvae are black and hairy, but they later develop a mottled yellow-gray pattern with tufts of stiff hairs and two rows of blue and red spots along the back. Mature larvae are about 2–2.5 inches long (4.0 – 6.5 cm). Gypsy moths reproduce once a year. Females tend to be flightless. They lay an egg mass containing between 500-1,500 eggs on tree trunks. The eggs overwinter and hatch in late spring or early summer. Larvae go through up to seven instars (developmental stages of insects between molts) and then pupate in late summer. Larve feed voraciously on tree leaves. In Alaska, they would feed on leaves from alder, birch, aspen, poplar, willow, hemlock, larch and fir trees. Larvae are nocturnal feeders and congregate in shady areas during the day. Pupation in the late summer lasts from 7-14 days before emergence as an adult. The males will emerge first and search for females. The females, generally being flightless, will lay their eggs near their pupation site. After mating, both adults die.